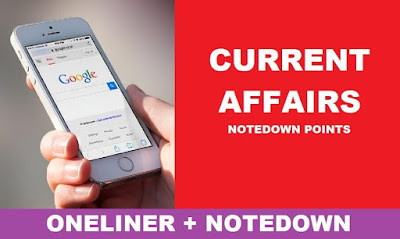 Current Affairs & GK Update of 21 July 2018 we cover all important National,International,Financial,Sports news which are relevant for upcoming SBI PO,SBI Clerk,SSC,IBPS RRB exams.We at Achieversrule regularly provide One Liner Current Affairs and GK Updates to keep our candidates prepared for Current Affairs section of Banking,Insurance exams and current affairs exam. In a bid to put an end to vehicle thefts, the government will soon launch a new standard for automobile industry, which involves use of a technology. In this technique, thousands of small dots laser etched will be sprayed with a vehicle identification number on all over the vehicle’s body. Chief Minister N. Chandrababu Naidu on Thursday launched ‘e-Pragati core platform’ at Undavalli, near here. e-Pragati, a forward-looking digital initiative, is aimed at connecting the citizen to 34 departments, 336 autonomous organisations and 745-plus services. The Goods and Services Tax (GST) Council meet in New Delhi today.. Finance Minister Piyush Goyal will chair the 28th meeting of the Council. As part of its plan to connect billions of people who are still offline, Facebook is working on launching Athena, its own Internet satellite, early in 2019.the project is designed to "efficiently provide broadband access to unserved and underserved areas throughout the world". Flipkart and Hotstar join hands to announce new ad platform - 'Shopper Audience Network'. In a first of its kind partnership in the industry, Flipkart, the e-commerce platform, and Hotstar, a streaming platform, recently announced the launch of Shopper Audience Network, Flipkart's new ads platform that allows brands to connect with customers through personalised TrueIntent video ads on Hotstar. Shri J P Nadda addresses 8th BRICS Health Ministers’ Meeting at Durban; highlights the achievements of India in the health sector. Ramchandra Singh Deo, who had the distinction of being the first finance minister of Chhattisgarh, passed away.Deo, who was once the king of an erstwhile Koriya kingdom (present-day Koriya district bordering with Madhya Pradesh), spent his youth being a photographer in association with famed filmmaker Satyajit Ray before beginning his career in politics. Shubhankar Sharma youngest Indian to make cut in a Major.Turning 22 on Saturday, Shubhankar Sharma gave himself a nice birthday present after rallying through the back nine to ensure he made it to the weekend at the British Open golf tournament. ALISSON Becker has officially joined Liverpool from Roma in a deal of 67 Million dollarsthat makes him the world’s most expensive goalkeeper. BIMSTEC: Bengal Initiative for multi-Sectoral Technical and Economic Cooperation. Member countries of BIMSTEC: Bangladesh,India,Myanmar,Sri Lanka,Thailand,Bhutan and Nepal. Currency of Nepal: Nepalese Rupee. Prime Minister of Nepal: khadga Prasad Oli. Union Minister of Health and Family Welfare: Shri J.P.Nadda. Governor of Chattisgarh: Balramji Dass Tandon. Chief minister of Chattisgarh: Raman Das. CEO of Facebook : Mark Zukerbarg.